Brazil's least developed state is Alagoas. It' pretty cool because it has one major road for a backbone that runs from Maceio, the capital, to the Sao Francisco River. There are a lot of other roads of varying quality. One of the major methods of transportation is still horse and buggy, but Maceio and Praia do Frances, where I stayed have high speed internet and good indoor plumbing. It's a very cool mix of modern life and 19th century. The primary occupation is fishing, and this boat seemed to symbolize it to me sort of like some of the old fishing boats in Maine. I also really like the color of the water, the line of trees, and the palm in the top left corner. PaulB's Pointillistic/Impressionist original oil paintings of Brazil and various prints and poster formats of a wide variety of subject matter by the Pointillistic/Impressionist oil painter from landscape/waterscape paintings, dance, sports, portrait, to classical figures, flowers, rock and roll, Brazil, and Brazil paintings and prints are available for purchase for as little as $24.95 for an 8" x 10" matted print on photo pape. 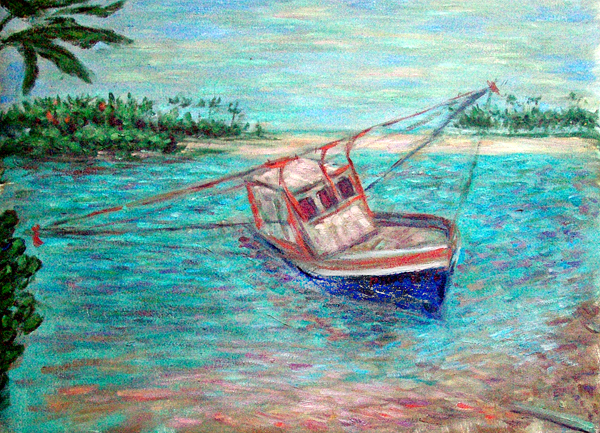 Pointillistic/Impressionist Giclee prints of Brazil on real canvas or heavy watercolor paper are available. One of a kind Brazilan embellished prints, which are Giclee prints retouched in genuine oil paint by PaulB. Unless noted PaulB's original Pointillistic/Impressionist oil paintiings are oil on canvas. Paul Berenson's pointillistic/Impressionist oil paintings are in privale collections around the world, including the downtown Los Angeles Athletic Club and have appeared in numerous publications, including the New York Philharmonic Playbill. PaulB.com also builds websites and PaulB is a member of the LA Web Professionals Group.